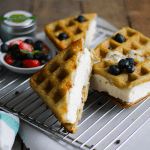 These fluffy and crispy Matcha Waffle Ice Cream Sandwiches make the perfect summer treat when layered with coconut milk ice cream. 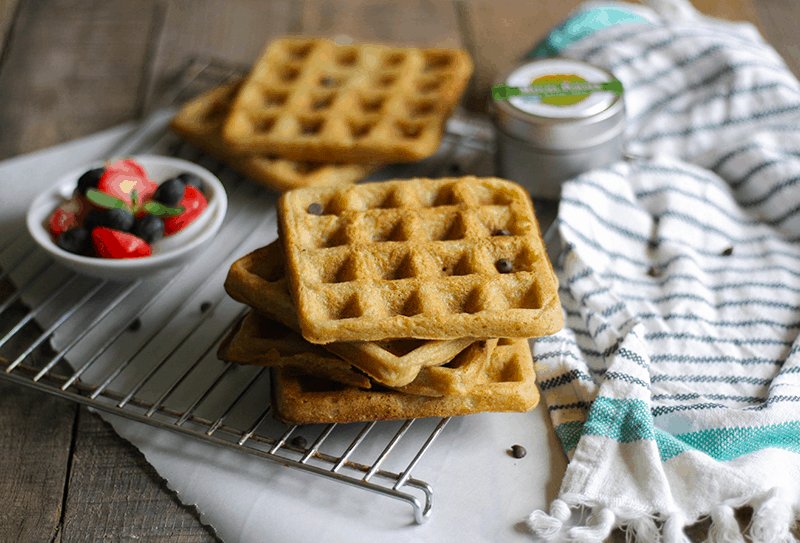 The matcha infused waffles are suitable for a completely healthy breakfast. They’re nut free, gluten free, and dairy free, and full of my favorite super-powder, matcha. Eat them for breakfast guilt free, or indulge in an afternoon summer treat by layering them with dairy free, low sugar ice cream. I’ve officially gone crazy for matcha. After perfecting hot and iced version of my Matcha Latte, I started working on some new ways to incorporate this super powder into my diet. I typically drink a matcha latte during the weekdays, and drink coffee on the weekends, so I was specifically trying to come up with something I could make for brunch that featured this green powder. Thus, these Matcha Waffles were born. I purchased an inexpensive waffle iron not too long ago, and it’s quickly become one of the most used weekend appliances. 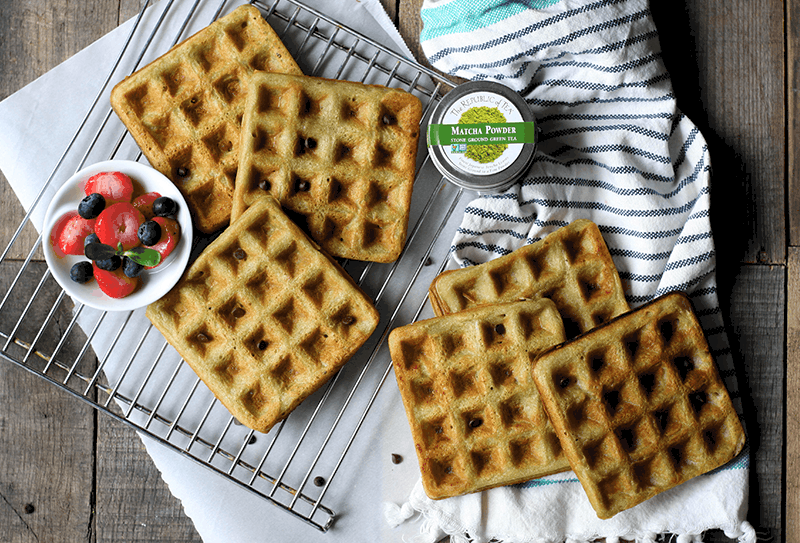 So far I’ve developed: 1. a savory waffle sandwich that I shared on Savory Lotus blog, 2. a high protein, low carb waffle (it was just okay), and now my new go to, 3. the matcha infused, gut healing waffle. That’s right folks, these waffles contain several superpowders! What classifies as a superpowder? 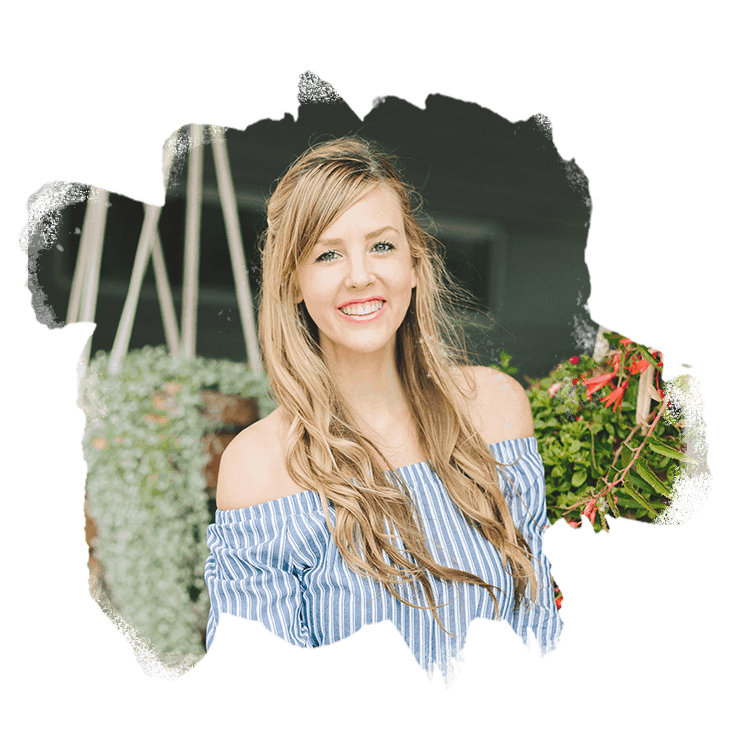 We’ve all heard of superfoods – foods that are incredibly nutrient dense, and have a long list of benefits. Well, I dubbed the term “superpowder” as a way to describe powdered products of similar status. These superpowders are supplemental to foods, meaning they can’t really be consumed alone. Not that we’ve identified what a superpowder is, let’s talk about the superpowders this recipe features. Matcha is extremely high in antioxidants, specifically, catechins such as EGCG. EGCG has been the subject of extensive clinical trials all over the world due to it’s amazing health benefits. Matcha is also a great source of blood building chlorophyll, vitamins, and minerals, as well as many polyphenols that we have yet to study. Collagen is one of the most abundant proteins in our bodies. There are 32 types of collagen found in the body, primarily types 1, 2 & 3. Types 1 & 3 are ubiquitous throughout our bone, tissue, skin, hair, and nails, and type 2 is found in our joints and connective tissue. Supplementing with collagen peptides can assist the body in strengthening any of these areas, as well as helping to heal any previous damage to our intestinal lining. Gelatin is often referred to as “cooked collagen”. The benefits, vitamins, amino acids, and minerals are almost identical to collagen peptides, but the differences lie in the application. Hydrolyzed collagen is easier to mix into cold liquids and won’t gel up, while gelatin does just that, specifically when blended into hot drinks. In this recipe, the gelatin acts as a replacement for gluten. Gelatin, like gluten, acts as a glue to give these waffles stability. 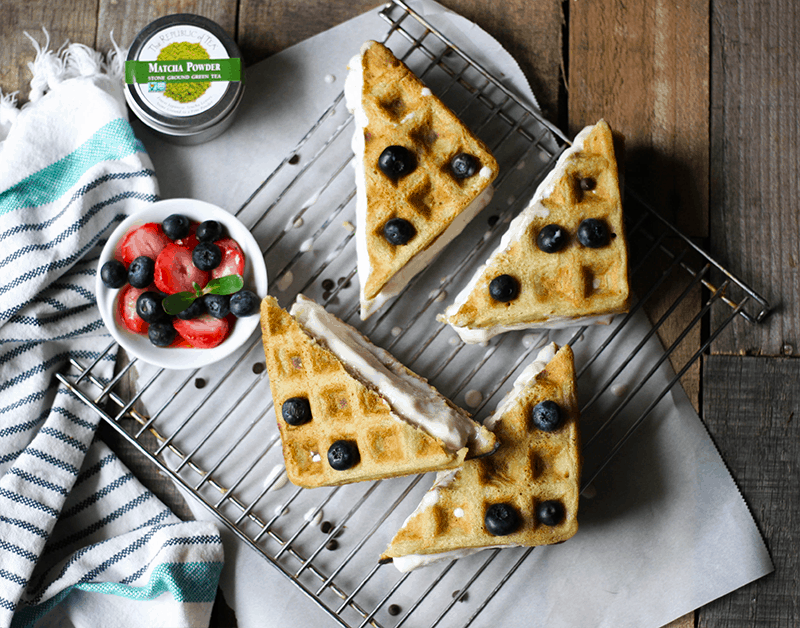 Since these waffles are crispy, fluffy, gluten free, and provide just a tiny bit of energy and focus, I thought they’d be the perfect swap for the cookie part of a standard ice cream sandwich. 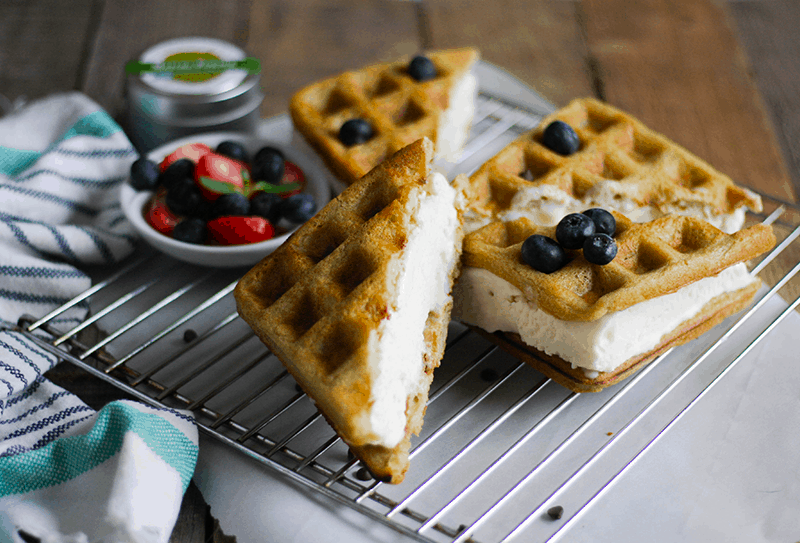 We used no sugar added ice cream, and layered it sandwiched in between two cooled waffles. Cut in half and enjoy for an afternoon treat. Preheat your waffle iron. My iron needed to be at the highest temp for the inside of the waffles to cook through, but every iron is different. If you’re unsure, I suggest testing this out on medium heat first, and increase the temperature as needed. Whisk together all dry ingredients in a large bowl: cassava flour, collagen, gelatin, matcha, baking powder, sea salt, and coconut sugar. In a medium sized bowl, combine the eggs, ghee, coconut milk, and 1/2 cup water. Add the wet ingredients to the dry, and whisk to combine. Be careful not to over mix! Depending on the consistency of your mixture, you’ll likely need to add 1/4 cup+ water to your mixture. Mine ended up needing an additional 1/4 cup the first time I made it, and an additional 1/2 cup the second. I suggest adding 1 Tbsp of water at a time, until the consistency is thicker than pancake batter, but is still able to pour. Add about 1/4-1/3 cup of waffle mix to your preheated waffle iron depending on the size. Mine was thick enough that the batter needed to be spread around a bit in the iron. Cook until golden brown and crispy. 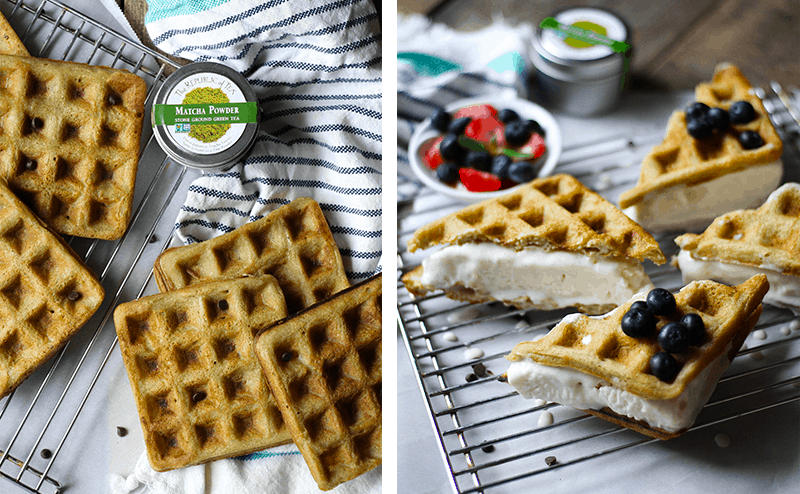 Serve warm as a healthy breakfast, or let cool for Matcha Waffle Ice Cream Sandwiches. Toppings of your choice – blueberries, strawberries, mini chocolate chips, etc. Line a cookie sheet with parchment paper, and spread the softened ice cream to be a rectangle about 4″ high, 8″ wide, and 2″ thick. Sprinkle with toppings of choice. Use the sides of the parchment paper to create an edge to the ice cream, and place another sheet of parchment on top to smooth it out. Place back in the freezer to harden. Once the ice cream has hardened, remove from freezer and slice the ice cream into 2 even squares, cutting parchment paper with the ice cream (don’t remove it before hand). Remove one side of the parchment, and place on top of a waffle. Remove and discard other side of the parchment, and top with a second waffle. Cut in half diagonally for a tasty Matcha Waffle Ice Cream Sandwich.